Poison Prevention Week is March 17th-23rd! 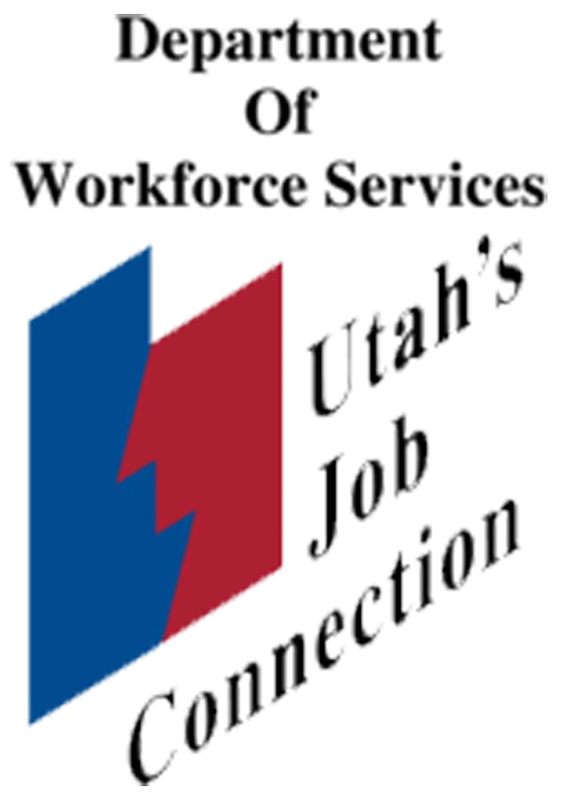 Each year, over 50,000 calls are received by the Utah Poison Control Center. More than 60% of the exposures involve children less than six years of age. In 2010, 94% of all poisonings occurred in the home. Fortunately 79% were managed on site with telephone follow-up. Therefore, it is critical to safeguard the home environment. 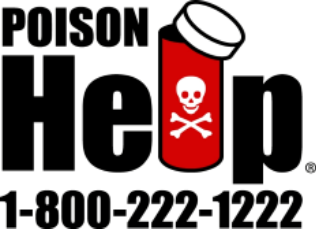 The Utah Poison Control Center reminds everyone to make poisoning prevention a year round responsibility. (3). Pain killers such as acetaminophen and ibuprofen. 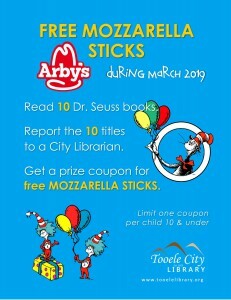 For more information on the Utah Poison Control Center, visit http://poisoncontrol.utah.edu/ To report a poisoning or possible poisoning, contact Tooele County Dispatch at 435-882-5600 or the Utah Poison Control Center at 800-222-1222. 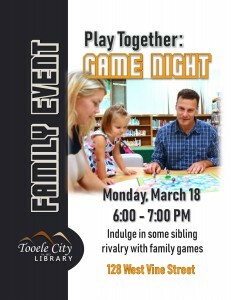 Indulge in some sibling rivalry at game night! 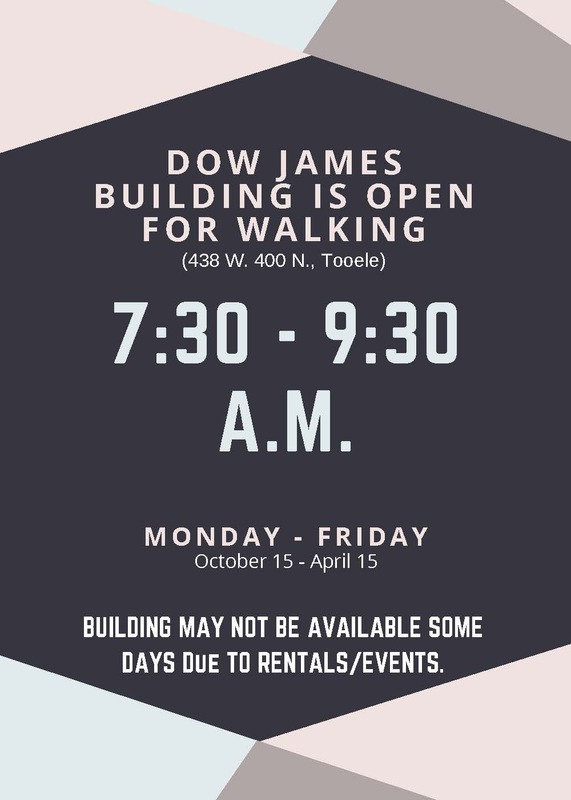 • Please call Craig at 435.833.7322 to register or for more information. Welcome to ENRICH … free computer courses from your Library! 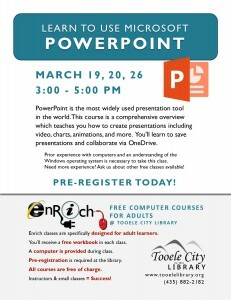 PowerPoint is the most widely used presentation tool in the world. This course is a comprehensive overview which teaches you how to create presentations including video, charts, animations, and more. You’ll learn to save presentations and collaborate via OneDrive. Prior experience with computers and an understanding of the Windows operating system is necessary to take this class. Need more experience? 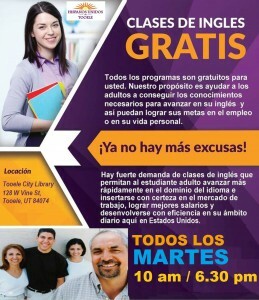 Ask us about other free classes available! 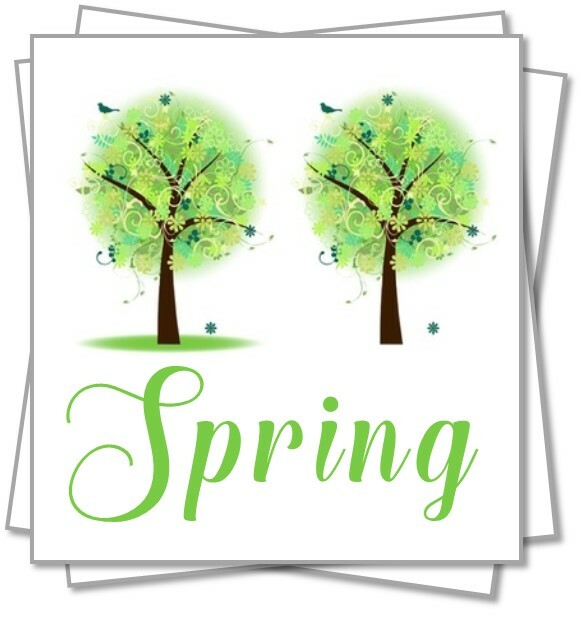 CLICK HERE to share your favorite photos of Spring time in Tooele City with us!